AIRCRETE Europe is an experienced project organization and technology provider for innovative building solutions for the international Autoclaved Aerated Concrete (AAC) and concrete industries. The company is a member of the Aircrete Group N.V. The group is focusing on fully integrated business solutions and investment opportunities related to the Autoclaved Aerated Concrete industry in selective high growth markets. We specialize in delivering the most innovative turnkey AAC plants and cutting-edge plant technology around the world. With more than 40 years of experience and an innovative team, AIRCRETE Europe uses advanced technologies and process know-how as the foundation for unique and tailored plant solutions. 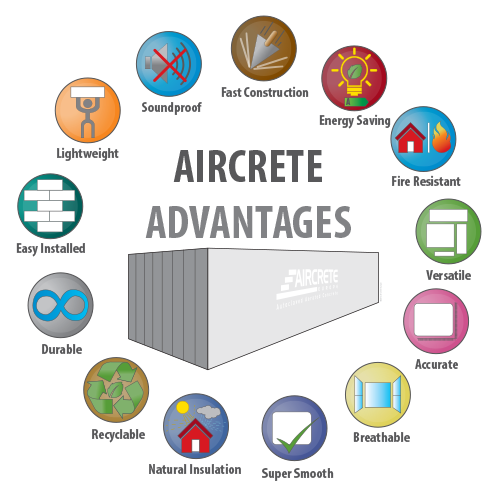 AAC is a green and sustainable building material and stands for Autoclaved Aerated Concrete, otherwise known as Aircrete. Adding fine aluminium powder to cement, lime, water and finely ground sand caused the mixture to expand considerably. Most common product densities vary between 350-700 kg per cubic meter. The finished Aircrete product is four to five times the volume of the raw materials used, making it extremely resource-efficient and environmentally friendly. The energy consumed in the production process is only a fraction compared to the production of other materials. Aircrete is currently used extensively in social, commercial, and industrial buildingsand is produced by many international plants worldwide.